The Siraya (Chinese: 西拉雅族; pinyin: Xīlāyǎ Zú) people are an indigenous people in Taiwan. The Siraya settled flat coastal plains in the southwest part of the island of Taiwan and corresponding sections of the east coast; the area is identified today with Tainan City and Taitung County. At least four communities make up the group: Mattauw, Soelangh, Baccloangh, and Sinckan. The first four communities correspond to the modern-day districts of Madou, Jiali, Shanhua, and Xinshi, respectively. The Siraya are Taiwanese Plains Aborigines (Pingpu) — that is, occupants of flat coastal regions rather than mountain areas. Like other indigenous peoples of Taiwan they are ethnically and linguistically Austronesian. The name "Taiwan" (historically Taiouwang, 臺員 and other variants) originated from the Siraya language. The Austronesian language family to which Sirayan belongs includes most of the languages spoken in the western Pacific, including Polynesian, Indonesian, Filipino and Malaysian. Taivoan and Makatao used to be considered two communities of the Siraya but are now classified as independent indigenous peoples, based on the latest linguistic discoveries, cultural features, and the indigenous people's self-identification. 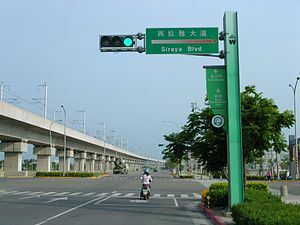 After the port in the Siraya area of Taiwan was annexed in 1683 by Qing Dynasty China, a process of gradual acculturation led to the Siraya language falling out of use. Its last recorded regular use was in 1908, after Taiwan was under Japanese rule. The mother tongue of most Siraya families became Hokkien Chinese, with Japanese and Mandarin Chinese learned in schools as the government-mandated lingua franca. The Siraya maintained many aspects of their culture despite this. A number of families in the Tso-chen, Kou-pei and Chiou-chen-lin of Sinhua Township in particular still identify themselves as Siraya. The family name Wan (萬), often encountered in the region, is a Chinese transliteration of Talavan, a common Siraya surname. A Siraya Culture Association (台南縣平埔族西拉雅文化協會) was established in 1999. In 2002 the reconstructed Siraya language (see below) began to be taught in schools and used in new literature. In 2005 the Tainan County (now part of Tainan City) government established a Siraya Aboriginal Affairs Committee (台南縣西拉雅原住民族事務委員會) and subsidised a glossary, released in 2008, containing entries for over 4,000 Sirayan words. Efforts have been under way by the Siraya and related plains aboriginal peoples to gain official recognition from Taiwan's national government. In 2010 the Siraya enlisted the aid of the United Nations. Siraya and Taiwan government representatives have noted a flaw in the language of the law: the Chinese term employed for indigenous peoples literally means "mountain people." A literal reading of the law excludes coastal groups from recognition automatically. Government officials have proposed changing the law to ensure accuracy and inclusion of all indigenous groups. According to Taiwan Journal, Taiwan's Academia Sinica historians and linguistics announced, on 14 February 2006, that their team of researchers have deciphered up to 80% of the 187 so-called Sinckan Manuscripts (or Sinkang Manuscripts), a set of documents from 17th and 18th centuries written in the language spoken by the Siraya people using a system of romanization introduced by the Dutch in the 17th century. In order to convert the Siraya to Christianity, Dutch missionaries studied the Sirayan language, devised a romanized script in which to record it, taught the Siraya people how to use it, and began translating the New Testament into the Sirayan language. Copies of the Dutch missionaries' translation of the Book of Matthew into Sirayan have survived, and several of the manuscripts are bilingual, with side-by-side Sirayan and Chinese versions of the contents. ^ a b c d e Crook, Steven (26 Sep 2008). "Taiwan Culture Portal - Pingpu tribe: We have not disappeared!". Culture.tw. Archived from the original on 2015-05-18. Retrieved 2013-01-23. ^ Adelaar, K.A. (1997). "Grammar notes on Siraya, an extinct Formosan language". Oceanic Linguistics. University of Hawai'i Press. 36 (2): 362–397. doi:10.2307/3622990. JSTOR 3622990. ^ Loa, Iok-sin (6 May 2010). "Pingpu activists ask UN assistance in Aboriginal claim". Taipei Times. p. 1. Retrieved 2013-01-23. ^ "CIP says Pingpu recognition requires law revision". Taipei Times. 27 May 2010. p. 3. Retrieved 2013-01-23. Shepherd, John Robert (1995). Marriage and mandatory abortion among the 17th century Siraya. Arlington, Va.: American Anthropological Assoc. ISBN 9780913167717. Lin Meng-ting (1 Feb 2015). "Siraya people to file suit to claim Aboriginal status". Taipei Times. p. 3. Retrieved 15 April 2016. Wikimedia Commons has media related to Siraya people.